February 15, 2013 / P.J. Disc golfers are often noted for being fans of nature and the outdoors. Brad Vehovic is taking it to a new level. 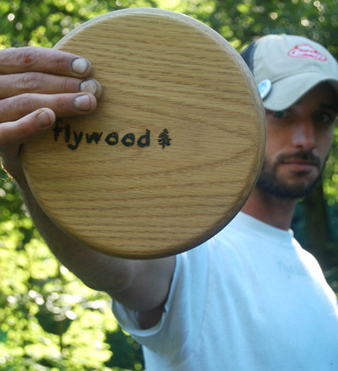 Vehovic, the owner and lone employee of Flywood Disc Innovations, is bringing a new look to the game with hand-crafted all-wood discs. Though not PDGA certified, the discs seems to have found a place in the game. He founded the Nicktown, Pennsylvania company in 2010. The main products are the all-natural wood discs and, in the past, the company has also produced wax, accessories and hemp discs. In a game where plastic rules and rubber has recently started to surge onto the scene, wood discs seem a little out of place. 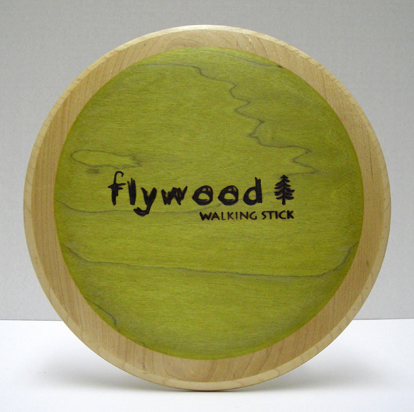 Especially because the discs Flywood produces can’t currently be used in PDGA events. To make his discs, Vehovic uses North American hard maple, Eco Glue wood adhesive, all-natural hemp oil and beeswax. Still, even though they are crafted by hand, why wood? “It’s the wood that makes it good,” Vehovic said. “Simplicity exists in earth’s trees, offering many natural uses and benefits. In my mind, the sport and its developing industry skipped a step. Credit Vehovic for thinking about taking the missed step. He said the idea of the company came while playing in Florida. During a busy day, he was playing pine cone hacky sack and a group of new friends offered up the idea. That night, Vehovic bought his first board. Soon after came a router. And then came time to research and see what he could come up with. The company offers three discs — The Walking Stick (driver), The Harvest (mid-range) and The Log (putter). According to the company’s website, all three discs are made out of Maple. The Walking Stick ranges in weights of 145-160 grams, The Harvest ranges from 140-165 and The Log is from 160-180. The process in shaping these discs has taken time. And the durability of these discs has grown as well. Vehovic said his discs will hold their shape after abuse, which is different than most plastic discs. This will provide consistency to the player. The process has taken time to develop these discs. He said choosing the materials and methods of making the discs took years of testing and trying different things, as well as a lot of testing. Vehovic said discs have been thrown into rock, concrete and steel and he’s still waiting for one to break during play. Discs like this aren’t cheap, however. Each disc is $30, but that includes shipping and some extra wax. “Flywood customers are at least curious about playing a natural product,” he said. “Many have become fanatical about using wood. We have found that once players have found that a natural wood disc can perform as well as anything plastic, they are more than willing to incur the expense. In September of 2011, North American Hard Maple became the wood of choice for the company. Vehovic said the wood is one of the hardest available in North America. On top of that, the wood is harvested in Northern Pennsylvania forests, which also provides a boost to the local economy. The wood which provides the color options comes from Canada, where veneer material is more accessible. Once the wood is in place, it’s time to make the disc. Each piece of wood that meets the company’s specification is kiln dried and stacked for a year. It’s then cut and split into layers, which gives each disc symmetry and consistency. There is gluing, pressing and cross-layering, which helps provide impact strength. It also helps each layer hold its shape. The disc blanks are then cut into circle form, branded, spun and cut on a lathe. Then, the discs cure via a drying process, which allows the hemp oil to soak into the disc, which makes the discs resistant to moisture and other weather conditions. The final stage — before sending the disc out — is to wax the disc. That helps provide more waterproofing. 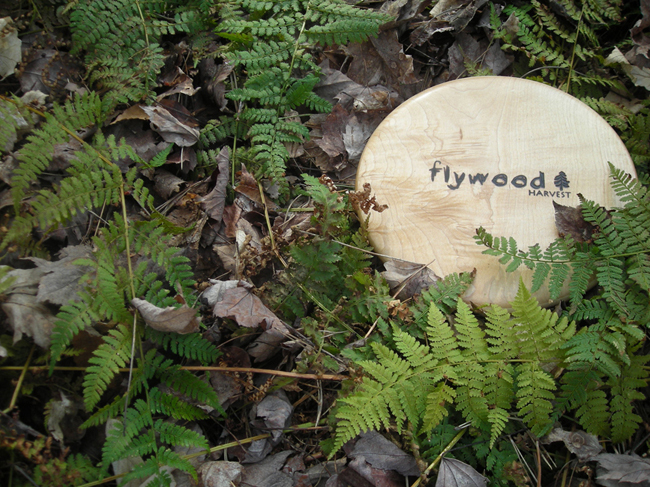 Owning a Flywood disc requires a little more care than a regular old disc though. Vehovic said players should reapply any oil about once a season. Discs should also be cleaned and re-waxing helps discs retain their feel, which can be similar to gripping plastic. Vehovic said flight patterns are quite consistent. A wood disc flying at a high rate of speed seems like it could do some damage if it hit a person. That being said, plastic discs can have sharp edges and are extremely solid, so any disc could essentially hurt somebody. just the same,” Vehovic said. Vehovic doesn’t seem to be taking his foot off the pedal any time soon. He said he hopes to introduce new models of discs and continue to grow his client base. And, of course, he said it would be important to eventually have discs be PDGA approved. See below for a video where the discs are in action. Since I learned about the history of the turbo putt disc,* I’ve been unhappy with the PDGA’s unwillingness act independently of the major disc makers. It seems like the tail is wagging the dog if disc manufacturers are able to exert pressure to keep out competition. Perhaps the big manufacturers, like Innova and Discraft, have too much influence over PDGA policy. Is this same pressure from disc makers keeping these wood discs from getting PDGA approval? I’d sure like to know before I consider renewing my PDGA membership. From the video the discs to appear to be right in line with the spirit of the game. I had a similar idea of a wood disc but not for play. I thought what a great trophy idea! 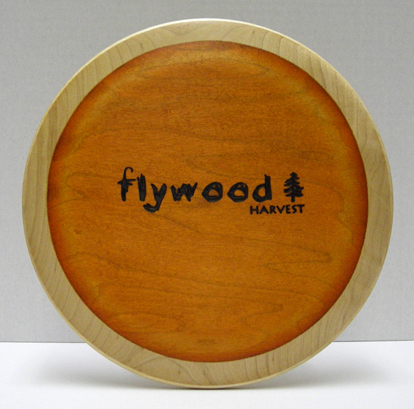 I thought it would be a unique idea for a tournament trophy to be produced in the shape of a golf disc with the wood being highly figured such as can be seen on some many find acoustic musical instruments…birdseye maple, tiger (striped) maple, spalt wood, cherry, pecan, etc. Any of the highly figured wood grains available. Spalted woods, due to their brittle character, may be harder to work with, however, but the results can be stunning. Kudos to Flywood for their innovation!!! So crazy that i want one. What an informative and great article! Huge kudos to Flywood!! I am going to have to get me one of these. I have the Putter (LOG), Midrange ( HARVEST) and Driver ( WALKING STICK) and they are all totally awesome! I think you can pick what ever color you want. Just ask when you order. I’m glad this article made it to fruition. Thank you, P.J. Those look really cool as a novelty item, but I’m not sure I’d really want to use them for a round of disc golf. I can’t imagine the grip would be very good, but if you like a firm disc, I guess you can’t beat wood. I personally own 10 “woodies” and keep 8 of them in my bag for every game I play. I got my first one, a Log, two years ago and, even after being chewed on by my dog, I still use it on just about every putt. They spin fast, draw a very consistent and predictable line for me every time and are tough as nails. Just seeing this article gives me a great feeling of justification for all the times I’ve had to listen guys on the course giving me crap for them (although they usually have to eat their words after they see me throw them). All natural tone targets could be amazing too. I would so love that… but I fear that they wouldn’t last a week, the way morons are always trying to break our baskets.